-- Battle of Solway Moss -- "Sollome mosse"
-- Eden, River -- "Solway Frith ot Itunae Flu now Eden R." -- "Eden R." -- "Eden R."
-- Gretna -- "Gretney Kirk"
-- Lyne, River -- "Leven River"
-- Medohush Wood (?) 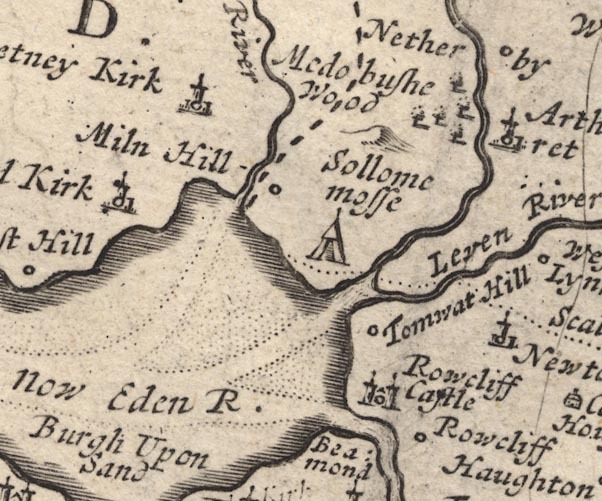 -- "Medobushe Wood"
-- Mill Hill -- "Miln Hill"
-- Redkirk -- "The Red Kirk"
-- Rockcliffe Castle (?) -- "Rowcliff Castle"
-- Solway Firth -- "Solway Frith ot Itunae Flu now Eden R."
-- Solway Moss -- "Sollome mosse"
-- Todhills -- "Tomwat Hill"